Since their first contact with humans, yellow-eyed penguins / hoiho have experienced tough times. They have been caught and eaten, and their forest homes have been destroyed to make way for farms and cities. Nets entangle them at sea and when ashore, introduced predatory mammals have decimated the remaining penguin population. Hoiho are classified globally as endangered and in New Zealand were recently (2016) reclassified as nationally endangered. Hoiho, in at least part of their range, are undergoing a serious continued decline in abundance. With fewer than 6000-7000 birds remaining in New Zealand, the hoiho is one of the most endangered penguin species in the world. By the breeding season of 1990/91 only an estimated 150 pairs were left on the South Island of New Zealand. 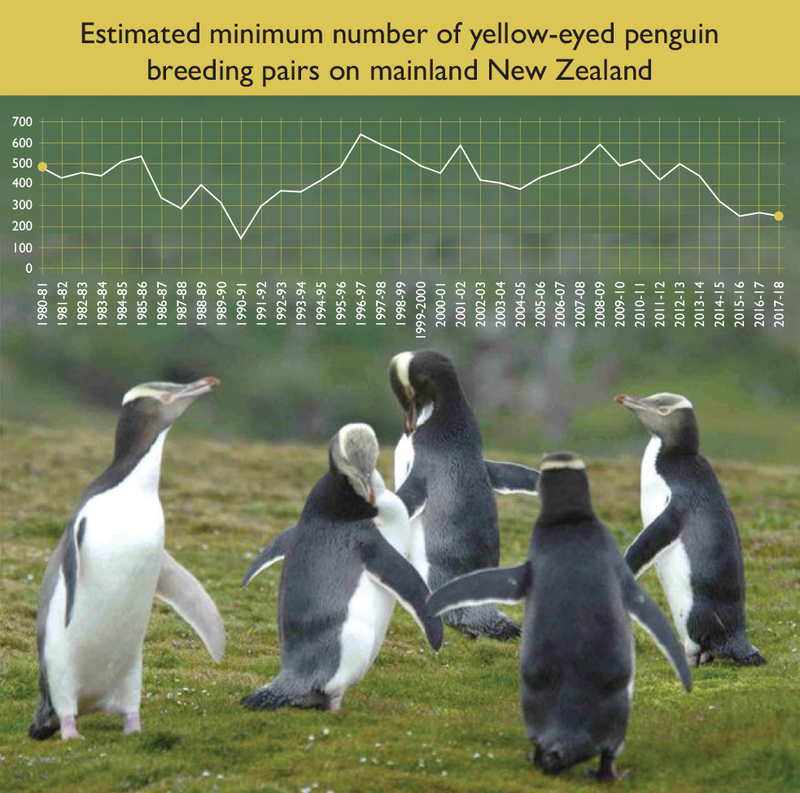 However, through the work of the Yellow-eyed Penguin Trust and other conservation groups to reduce predators, numbers increased to a high of about 600 pairs on mainland New Zealand in 1996/97. Since then numbers have peaked and troughed, in response to a range of impacts including starvation, disease, bycatch and other human threats. An ongoing decline in the seasons following 2008/09 led to a low of 225 pairs in 2018/19 – the lowest level since 1990/91. Hoiho numbers continue to decline despite current terrestrial conservation management efforts. Multiple threats affect hoiho in the marine and terrestrial environment and as the population declines it is likely to become less resilient to future impacts. Help us to protect the hoiho – they need people like you to help them survive.